Dinosaur 13 is a fairly well-made, though sometimes rambling, documentary. But like some documentaries, it avoids the opportunity to tell a complex story fairly in order to tell a simpler story more easily. Dinosaur 13 tells part of the chronological history of what happened with the Tyrannosaurus rex specimen Sue from her discovery onwards and what happened to the people involved in the discovery. Legal troubles. Lots of legal troubles. Fossil is fine, but the cost to one person is ridiculous. At the end of the film, the film mentions that it's not an original story. It's an adaptation of Rex Appeal: The Amazing Story of Sue, the Dinosaur That Changed Science, the Law, and My Life. That 2002 book was written by Peter Larson and Kristin Donnan and included a foreword by Robert Bakker. And this documentary interviews 24 people, of whom three are Peter Larson, Kristin Donnan, and Robert Bakker. Who, unsurprisingly, basically say things they already said in that book. So you could read that book and get almost exactly the same story as what Dinosaur 13 tells. Or you could visit the Black Hills Institute (BHI)'s website about Sue which tells their story and get almost exactly the same story as what Dinosaur 13 tells. Or I guess you could read Tyrannosaurus Sue: The Extraordinary Saga of the Largest, Most Fought Over T-Rex Ever Found, a 2000 book by Steve Fiffer (which is on Google books). Maybe that tells a slightly different version of this story since it's by different authors. Or you could watch (or read this transcript of) the 1997 Nova episode "Curse of the T. rex" and actually get more sides of the story than Dinosaur 13 provides. My point here is that, to the people who have already read about Sue, this movie doesn't do much to update anyone on the situation or its aftermath. There are mentions of what some of the people involved have been up to since the 1990s, and that's it. It's a film about events in the 1990s that has little interest in what has happened since then. And that's very odd because Sue completely altered public notions on how much dinosaur fossils cost. But I guess that's not what this movie wants to be about. When collecting fossils in the American West, because land ownership is such a patchwork and the possible rules are so complex, people have to do their best to avoid making mistakes. In August of 1990, Larson and his crew from the BHI made a mistake of collecting on land which the landowner, Maurice Williams, did not have the right to collect from, because the land was technically federal government land. Allegedly, BHI was unaware of this, whereas Mr. Williams allegedly was. Mr. Williams sounds like he was a difficult landowner to work with, allegedly demanding that the BHI crew drive onto his property as little as possible. Even after they found Sue, he still made them park at the edge of his property and walk to Sue's location. When getting a collecting team and equipment to a tyrannosaur, that's making their work more difficult for little-to-no reason. 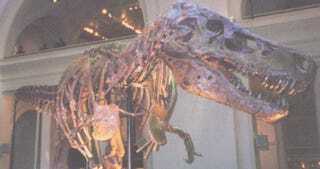 He also allegedly refused to sign a contract for the sale and subsequent display of the fossil, and allegedly, over a handshake, agreed to sell the fossil to BHI so they could prepare it and mount it at a to-be-built museum in Hill City, South Dakota. To compound the mistake of collecting on land without permission, Mr. Williams was given a check for 5000 USD. So now the BHI was paying for material that the landowner can't sell without permission. This check starts up all kinds of trouble. 13 minutes into Dinosaur 13, Neal Larson says that 5000 USD was the most money ever given for a dinosaur1, and the BHI's recounting of the story tells us that BHI could literally not pay a single cent more at the time; after an expensive field season they only had 5000 USD in their accounts to spend. And somewhat oddly, the check is for "Theropod Sue", which, while technically true, is quite a bit less exciting than being for "Tyrannosaurus Sue". Somewhere in time, either in August of 1990 or very shortly thereafter, Mr. Williams did not think that 5000 USD was all that he was owed. The December 2nd 1992 issue of the Rapid City Journal had this article, which is shown in Dinosaur 13. This article reported that 10 weeks after Mr. Williams was given a check, he told Peter Larson that the check was for the excavation of Sue, not for its purchase. That Mr. Williams was allegedly being loud about the 5000 USD check before 1990 was over is not mentioned by the film's silent narrator or any of the interviewees, who sound like Mr. Williams was quiet about things until 1992. I used the word allegedly up above a lot because the film never interviews Maurice Williams's family. This is weird in light of how Mr. Williams was interviewed by Nova's episode about Sue which aired in 1997. NARRATOR: Meanwhile, Maurice Williams asked the U.S. Attorney to help him get the dinosaur back, denying that he never sold it to Larson in the first place. MAURICE WILLIAMS: Well, I'm assuming he got that idea from that check that he wrote. But there was no mention of any sale between he and I of anything. Essentially, the legal battle over Sue began as a conflict between two parties who have very different stories on what happened in August of 1990. Mr. Williams, having died in 2011, was dead before Dinosaur 13 started being made, but his family, including his wife, is not. And earlier this year she gave an interesting quote about that 5000 USD check. However, according to Darlene Williams, Maurice's widow, the $5,000 was a payment for having disturbed the land, not for the dinosaur. "I heard Maurice on the phone, they didn't say anything about fossils. The $5,000 was not for removing fossils, but for digging on the land. "When they found that on our property, Maurice told them it was trust land and the government had to be involved, but they took it anyway," Williams said. "We had a lawyer write to them and they flat out said it was theirs and we had nothing to say about it. They sent us a letter and as much admitted they had taken it. But my husband knew all about trust status, and he kept everything in a file cabinet." Laughing quietly, she added, "I guess they didn't know he was that kind of man." This is an interesting quote for a lot of reasons, and it makes me seriously wonder if no one from the Williams family was involved in any aspect of the production of Dinosaur 13. Video of Mr. Williams and photographs of him and his family are shown multiple times during the film, and yet their voices (except for Mr. Williams's voice, via BHI-provided video footage from 1990) are entirely absent from the film. This seems very very weird saying as how the story of Sue and all the trouble it created is intimately tied to the land where it was found. This is a movie about a dinosaur sold by its owner who never talks to the family of the owner of the dinosaur, and multiple interviewees make comments about how Mr. Williams was misleading at best and an intentional scam artist at worst. The only reason I can see for the purposeful exclusion of the Williams family comes from, of all places, a comment on an Amazon review of Rex Appeal. I have seen no other mention, anywhere else, of the claims made in that comment, so I cannot speak to their veracity. But if those claims are true, they seem like a solid reason for Peter Larson to not want to talk with the Williams. That might mean that the filmmakers of Dinosaur 13 had to pick which side of the story they had to tell, and they chose … the one that's already been published. And by not having counter-opinions the film fails to tell as complete of a story as it could have. A lot of bad things happened to Peter Larson as a consequence for being involved in the Sue saga, one of which is that all of the legal complaints about him and the BHI came to court. He was eventually found guilty of two misdemeanor theft charges and two felony charges of transporting large sums of money into and out of the US without informing US customs. And at the time those should have added up to about 6 months of federal prison time. But the judge wanted to make an example of Mr. Larson and so he gave him 24 months of federal prison time. The film allows Robert Bakker to provide his explanation of why the judge decided to do that. "The reason the judge did it is because he had been urged, he had been convinced, by guys with PhDs, at university museums, that it had to be done for the safety of our science and our fossils and it was so totally wrong." That's the second time in the film that Robert Bakker (who is a guy with a PhD, who has worked at multiple museums and universities) is quoted as supporting an anti-academic paleontology point of view. Earlier in the film about two minutes are spent on trying to portray the Sue experience as part of a "commercial paleontologist vs. academic paleontologist" fight. And it's really weird that the film tries to start this fight because it quotes Dr. Philip Currie repeatedly and he never talks about the BHI or Peter Larson in a bad light for being (gasp!!!!) commercial paleontologists. This quote from Dr. Bakker seems completely unconnected to the Sue situation unless there's evidence somewhere (never presented by the film) that academic paleontologists actually literally told the judge in the BHI fossil case that Peter Larson was a bad man and commercial paleontology is bad and naughty and he should be punished for collecting dinosaurs without a PhD. Edited to add: There is evidence that academic paleontologists did literally tell the judge in the BHI fossil case that the Black Hills Institute didn't do science and shouldn't be trusted to have Sue. This evidence is never mentioned in Dinosaur 13. I agree with Susan Hendrickson's comment late in the film that "morally" Sue "should be" in South Dakota. It would be great if all fossils were kept as close as possible to their initial place of excavation so that it's relatively easy, in the same day, to see a fossil and see the area where that fossil was excavated from. That would help science out a lot. But legally Mr. Williams had the right, after he got federal government permission, to sell Sue to whomever he wanted to. That's how fossil laws in the United States are set up, and it's a setup that commercial paleontologists in the US think is fair and acceptable. BHI sells fossils that it has collected on private land in South Dakota, and I assume that they're not only shipping to people in South Dakota. "People need to make a living. [But] they need to do it legally, whether they agree with the law or not. If not, it hurts everybody. It hurts the science, it hurts the public who are cheated from not being able to see the specimen." Peter Larson said that in 2013 about a commercial paleontology case wherein someone was involved with the illegal transport of fossils out of Mongolia. I agree with what Peter Larson said last year. If people are going to make money from paleontology, they should do it legally. Just like he does, most of the time. Unfortunately, he made some bad choices in 1990 and he got punished over-severely for those choices. Dinosaur 13 gives him another opportunity to tell his side of the story of the tumultuous years that he paid for his mistakes. Unfortunately, Dinosaur 13 gives very few other people an opportunity to tell their side of the story, doing a disservice to both the audience and the people whose story isn't told. I've looked at BHI specimens which were traded to another museum from BHI, I've talked with Peter Larson although not about this film or about Sue, I've looked at fossils at the museum which held Sue while she was held pending criminal trial, and I've seen Sue a few times in my life. I have never been to the BHI but I support what they do2 as long as they take all legal precautions seriously. Top image of FMNH PR2081, "Sue", provided by myself. 1 From what I've read, this is not completely true, as the American Museum of Natural History sold the holotype of Tyrannosaurus rex (specimen number AMNH 973 at the time) to the Carnegie Museum of Natural History (making it into CM 9830, the specimen number it remains as today) in 1941 for something around 7000 USD in 1941 dollars. In 1990 this would have been about 61000 USD, which is quite a bit more than the 5000 USD allegedly paid for Sue. Of course it could be argued that a fully prepared dinosaur is financially worth more than a dinosaur still in rock, but the film doesn't talk about that so I won't either. 2 I am including this here because a few online conversations about Dinosaur 13 become "The Black Hills Institute is great!" comment fests. I have no animosity towards BHI. I do, however, have a large animosity towards this film pretending to be objective when it completely ignores a side to a story. If you want to make a comment talking up the BHI, feel free to do so, and I'll feel free to ignore it unless it has substance.